NEW YORK – Adrian Peterson's whirlwind week would make great fodder for the famous Page Six gossip column and the New York tabloids. 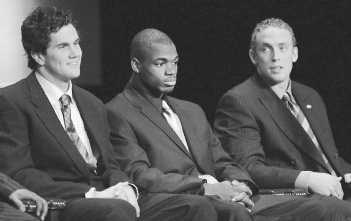 From left, USC's Matt Leinart and OU's Adrian Peterson and Jason White finished first, second and third, respectively, in the Heisman Trophy voting. Peterson's runner-up finish was the best for a freshman in Heisman history. The native Texan was whisked to Orlando, Fla., where Peterson was a finalist for the Maxwell and Doak Walker awards. He didn't win either at the Home Depot Awards show, but rubbing elbows with college football's elite wasn't bad, either. Then came Saturday's Heisman Trophy ceremony under the bright lights at the New York Hilton. Southern California quarterback Matt Leinart won this time, but Peterson came in second, which was the highest finish of any freshman in Heisman history. Throw in the fact that the Walter Camp Foundation and the Football Writers Association of America both named Peterson a first-team All-American, and it made for a busy week. "He did better than I thought he would," said OU quarterback Jason White, no stranger to the banquet circuit. "That was until tonight, when he was a little uptight." Peterson, who graduated from Palestine, said he was a little nervous initially sitting on the stage Saturday. But as the show wore on, Peterson said he became more and more comfortable. He did the same thing this season. "It's been a good experience for me," Peterson said. "I had a lot of fun and really enjoyed myself. I'm ready to come back next year and do it all over again." Peterson certainly has the potential to contend for more major awards in the future. He set a Division I-A freshman record this season with 11 100-yard games. Against USC in the FedEx Orange Bowl on Jan. 4, Peterson could break the OU season rushing record and the NCAA freshman rushing mark. It shouldn't come as a surprise considering his genes. Peterson's mother, Bonita, was a three-time Class 3A state champion in the 100 meters. His father, Nelson, was a basketball standout in Florida and played at Lon Morris College in Jacksonville, Texas. Palestine resident Steve Eudey was Peterson's legal guardian during the eighth grade and still acts as a mentor today. Eudey said he and Peterson have talked during the season about handling the fame that's come so quickly. But Eudey's still not sure the 6-2, 210-pounder fully grasps what exactly he has accomplished. "I think it's all happened so fast," Eudey said Saturday. "Remember back to the very first game, it wasn't known if he was going to play. The coaches weren't sure if they were going to play Adrian or [freshman] D.J. [Wolfe] first. From there, it's been a roller-coaster ride downhill about 100 miles an hour." Peterson said: "Oh, I get it. I fully understand what's happening. I just take things as they come." Peterson may not have collected any individual awards this year. But he has accumulated fame in abundance.